Provide comfort for the family of Richard Turkington with a meaningful gesture of sympathy. Richard E. Turkington passed away January 3, 2019 at the age of 93. He was born September 19, 1925, son of the late Richard and Edith Proctor Turkington. He was a veteran of the U.S. Army Air Corps during WWII and was a volunteer at the Milford Police Department for 15 years in the Crime Prevention Unit and a Red Cross Volunteer Driver for many years. 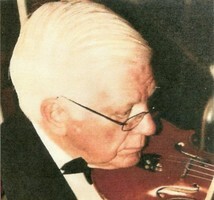 He was a violinist with the West Haven Symphony Orchestra as well as the Nutmeg Symphonic Pops Orchestra. He was a staff member of the Purchasing Department at Sikorsky Aircraft in Stratford for many years. A graduate of UConn, he was an avid fan of the UConn Women's basketball team. He was also a member of the Milford Senior Center and a participant of First United Church of Christ of Milford where he served as a member of the bell choir for many years. Richard was survived by his wife, Eleanore Myers Turkington and two children, Susan Morong and John Turkington, step-children Glenn and Robin Myers, and Patricia and Peter Hall, his grandchildren, Melanie O'Leary, William Baird, Sara DiLorio, and Jack Turkington, his great grandchildren, Leo DiLorio, and Benjamin and Elizabeth Baird as well as the families of his survivors including many step-grandchildren including U.S. Army Captain Richard Brantley. Besides his parents, he was predeceased by his first wife, June Robinson Turkington. Calling hours will be held Monday, January 7, 2019 from 4 p.m. to 8 p.m. at Smith Funeral Home, 135 N. Broad St., Milford. Funeral services will be held Tuesday January 8, 2018 at 10 a.m. in the funeral home with Rev. Ashley Grant officiating. Interment with military honors will follow at St. Mary Cemetery, Milford. In lieu of flowers, memorial contributions may be made to the Milford Senior Center, 9 Jepson Dr., Milford, CT 06460. To send flowers in memory of Richard E. Turkington, please visit our Heartfelt Sympathies Store. Provide comfort for the family of Richard E. Turkington by sending flowers.